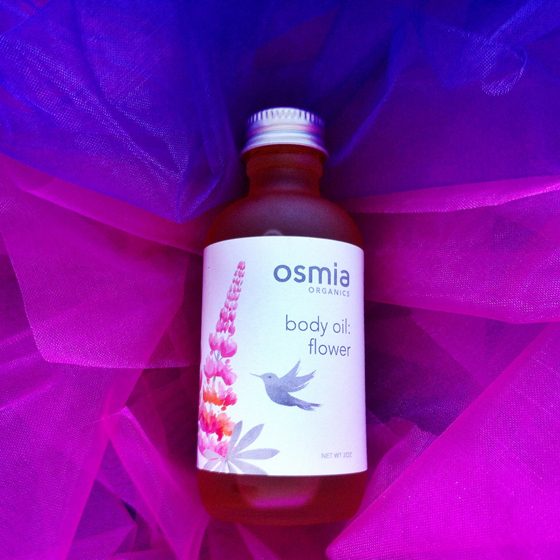 The feeling evoked when using Osmia’s Flower Body Oil ($25, 2 oz.) was bliss. Far from TOO fragrant, (for those of you with sensitive snouts) I really enjoyed this lively scent, and it was a welcome reminder of the smells of summer now that we are into the cold season. A blend of organic rose geranium, organic linden blossom, and zdravets essential oils, it was so much fun putting this oil on right after showering! I love that those are the directions: “Apply onto WET skin.” I have never tried it on dry skin, but I imagine it would likely leave your skin a little slick. When you apply right out of the shower or bath, it really penetrates deep into your skin, and instead of leaving it greasy, it just leaves it soft with a subtle kiss of feminine, fresh scent. Note that the smaller size doesn’t come with a pump, which makes for a messier application. 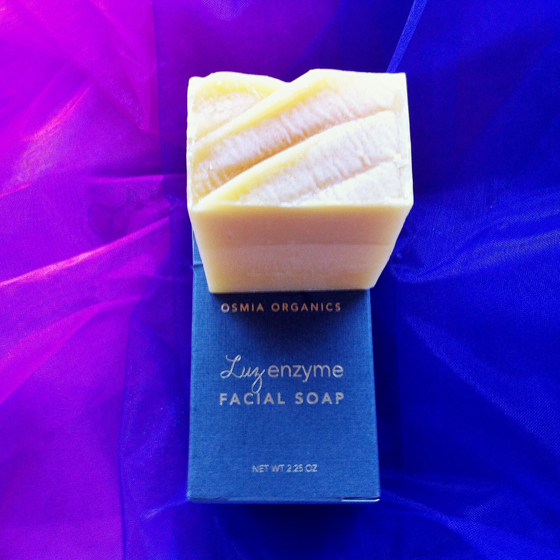 The Luz Enzyme Facial Soap ($24, 2.25 oz.) had me skeptical at first. I didn’t mind using a bar soap on my face, but I was a little conflicted as to how to best apply it. Washcloth? Facial brush? In the end, I just used my hands and water to work it into a lather. That seems to be working best for me. I like to use this when my face is feeling extra weighed down by oil or makeup. This is a Friday soap, ya know what I mean? You know. Infused with organic pumpkin and tomato, this is also your cold weather soap. It will nourish and brighten your wintered skin with essential carrot seed, carrot root, rosewood and geranium oils…all known for their restorative effects. It’s such a luxurious little soap! I was also given small samples of the Facial Calibration Serum and the Luz Facial Brightening Serum. The Brightening serum contains that “liquid gold” ingredient: prickly pear oil, which really lends itself to smoothing out fine lines leading to more luminous skin. The main ingredients in this serum are organic argan and camellia oils, so it goes on quite smooth, and absorbs quickly. I used it only a few times as per the sample, but was super impressed with it’s soothing and smoothing abilities. Putting this baby on before bed is sure to guarantee a soft and supple mug in the morning. The Calibration Serum is something I waited to try until my skin was giving me a fight (usually once a month, amiright ladies?) and I was relieved to have it in my arsenal. It is an odd thing…applying oil to your skin when you are the midst of a pimple explosion goes against everything they told us millennials in the early 2000s. Of course, we know better now about the redeeming qualities of pure, natural, high-quality, organic oils for skincare. And boy, Osmia knows what they are doin’. The calming schisandra fruit extract soothes irritation and the macadamia, olive squalane, and kukui oils nourish the skin. The combination of ingredients in this product helps balance your skin back out and assists in regulating sebum production. What’s your favorite Osmia product?! Previous Article Are you a skin care herbivore? Just wondering why the soap is called enzyme? So far I only have the spot treatment from Osmia, but I absolutely love it. I really want to try their lip repair, too. I used Jennifer’s Spot Repair this summer a few times and was very sad I didn’t own it myself! Osmia soaps and body oils are the absolute BEST. I’m also crazy about the black clay facial soap (for oily/acneic skin) and the Spot Treatment. It works! My favorite oil is Sunset, but Flower is a close second. Glad you finally got to try Osmia!!! 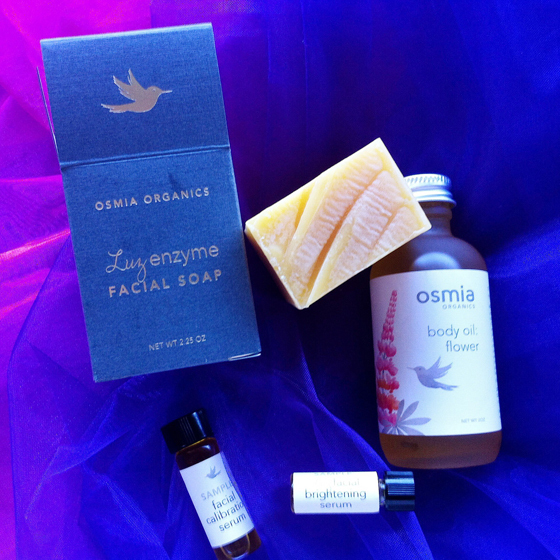 I love Osmia Organics and have adored all the products I’ve tried from them! Their spot treatment has worked very well for me, though it is a bit pricey for what you’re getting. I also am a big fan of the Sunset body oil, and definitely want to try Flower now. This brand looks lovely, and I now feel like a bad blogger for not trying them!